The goal of every business is to attract as many customers as possible, and that means having an effective marketing strategy in place. One great way to do that is by handing out promotional gifts to customers, with the understanding that choosing the wrong items can actually have a negative effect on the business. What makes one promotional product more appealing that another is by making it something that the customer can actually use regularly, and there may be nothing that fits the bill better than custom t shirts. Custom t shirt printing doesn’t have to be an expensive financial outlay for the business, especially when ordering in bulk. Not only is it an incredibly effective way of getting the brand out to the masses, but also takes advantage of a fashion trend that is incredibly hot at the moment. Take a look at the people that come in and quickly notice how many of them are wearing t shirts, many of which are for products and company promotion. There is a reason why bars and restaurants sell t shirts and polos with their name on it, and that is because they realize that it builds a bond with their customers. Patrons of a bar are happy to sport the logo of the place that they love to hang out, which makes it the ideal win/win situation for the customer and the establishment. The shirt wearer gets a cool piece of clothing that looks great, and the bar gets a little bit of free advertising every time that person chooses to throw on that t shirt. The other great thing with using custom t shirt printing as part of a marketing strategy is that you are in complete control over how the finished article looks. Go with a simple look with nothing but the company logo across the chest or come up with a witty slogan or catchphrase, which is actually something that is very popular at the moment. You are also in complete control of the colors chosen, which is great if to make logos pop off the fabric. The final design will end up being a perfect representation of what the company is all about, which is exactly what we should be trying to achieve with all advertising efforts. It’s always a great idea to make the business seem relevant, and given that custom t shirt printing is so popular right now, giving away that freebie will really make an impression. You will be surprised at just how many people will go out of their way to come to the business or visit the booth at a trade show when they hear that there is a nicely designed t shirt awaiting them. Making a great looking shirt is a guarantee that the person will wear it again and again, and every time they do, it’s the equivalent of having a horde of human billboards around town at a fraction of the cost. 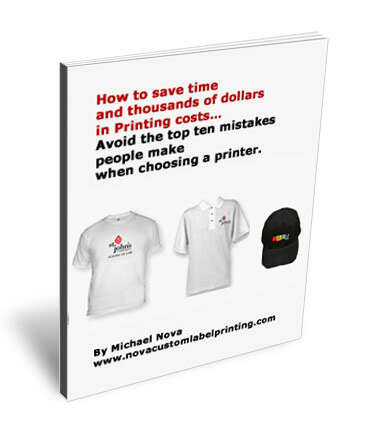 This Custom T Shirt Printing Article was written by L. Taylor for Nova Custom T Shirt Printing.